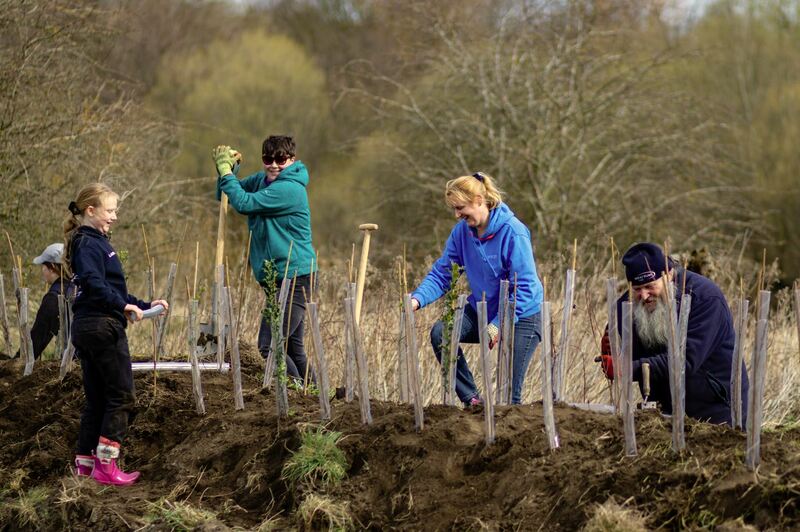 A team of volunteers has embarked on an epic mission to plant more than 8,000 native trees and shrubs at Kynren, Bishop Auckland. The team are hard at work planting 27 different varieties of hedging plants, trees and bushes; all of which are UK heritage species. As well as providing a beautiful, natural backdrop for visitors to the award-winning live outdoor theatre performances, the mass planting will also create significant new wildlife areas and boost biodiversity on the site. “As Kynren grows and the site expands to include other attractions alongside the show, our aim is to provide a visually stunning visitor experience with an abundance of flora and fauna,” said Anna Warnecke, Director of Cavalry and Estates. “Across the site we will feature many heritage plants which will not only enhance our visitor experience but also create more habitats for wildlife,” she added. There have been over 300 metres of hedging and trees planted already and Kynren has also created a nursery on site where the plants will be kept before being moved to their permanent homes in other locations around the site. Among the varieties being planted are field maple, silver birch, hawthorn, beech, and many other fringe species. All the trees and plants are being supplied by Yorkshire-based Johnsons of Whixley Ltd. Established in 1921, the family-run plant nursery has experience in growing plants for specific, high-profile schemes including the Forth Road Bridge, Royal Parks, HS1 and the Athletes, Village at the Glasgow Commonwealth Games. Eleanor Richardson, Marketing & Sales Coordinator, said: “It’s great to be associated with the UK’s leading outdoor live-action show, we were already aware of Kynren as our chairman John Richardson had attended one of the shows last year and commented on how fantastic it was. “Adding such quantities of native trees and shrubs reinforces Kynren’s ‘green’ and environmental credentials,” she said.